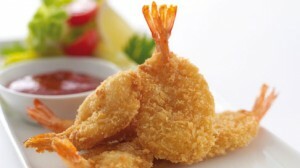 Breaded Prawns recipe by Nazia Nazar at DesiRecipes.com. Peel the fresh prawns, leaving the tails on, and cut them at the back to make them flat. Add salt , sesame oil and a dash of pepper to taste and set aside. Prepare bread crumbs, plain flour and beaten egg. Roll the prawns into the plain flour, soak into the beaten egg and again roll in breadcrumbs. Fry for about 1 minutes until golden brown.